OK. Now that that’s over with, let’s get into the real nitty gritty stuff that came out of #ElTrafico shall we? Because while that volley was out of this world, any Euro snob would’ve been able to tell you that goals like that are a dime a dozen for Zlatan. Zlatan did Zlatan things. Moving on. The game flipped when Sebastian Lletget opened the scoring for the hosts in 61st minute. The tone of the game changed immediately because ‘there’s no more dangerous lead in soccer than a two-goal lead.’ (I’m joking.) But following the goal, Sigi Schmid did the right thing that swapped out Servando Carrasco for Baggio Husidic. Zlatan will get the credit today...and deservedly so. This is where the magic happens for players like Benny Feilhaber and Carlos Vela. There’s four key passes, two assists and a lot of positive passing into attacking areas. Basically, they were afforded far too much space and time to orchestrate the offense for LAFC, which explains how they easily raced to a 3-0 lead. Now the game state certainly plays a factor here, as now LAFC is protecting a two goal lead, instead of three and Bob Bradley started exercising caution when pushing forward. But it is pretty damning when most of your passes in zone 14 are now going backwards or laterally. But this also points to why coaches sometimes make a ‘defensive’ substitution when chasing a game. Husidic gave the Galaxy fresh legs to finish off what Carasco had started. Carasco had started pressing higher up the field, and logged three defensive actions in the second half, the ones you see highest up the field. LAG were starting to press, but Sigi realized he needed his midfield utility man to see the press to completion. Husidic came on and dropped much deeper. Zlatan is Zlatan, and he’s certainly going to do his thing in MLS, but it’ll be the cost of role players that will push the Galaxy back to MLS Cup contention in 2018. Is Brad Friedel For Real? Consider me one that scoffed at Friedel’s hiring to coach the New England Revolution. It had a similar feel for when the Colorado Rapids brought in Pablo Mastroeni - good player, but incredibly unproven coach. Then when Friedal refused to honor Lee Nguyen’s trade request during the off-season and has exiled him from game days, it appears that Friedel was ready to bring back an ‘old school’ mentality to the Revolution that probably wasn't going to connect well with his players. After four games, the Revs are sitting comfortably at 2-1-1 in a very competitive Eastern Conference - and all without Nguyen seeing the field - but I’m still not convinced that they’re actual contenders at this point. Friedel has established his team as a counter attacking side, having just enjoyed 41% of possession through four games (though to be fair, they were reduced to 10 men in their season opening loss after 24 minutes and then eventually went down to 9 men at the 86th minute). 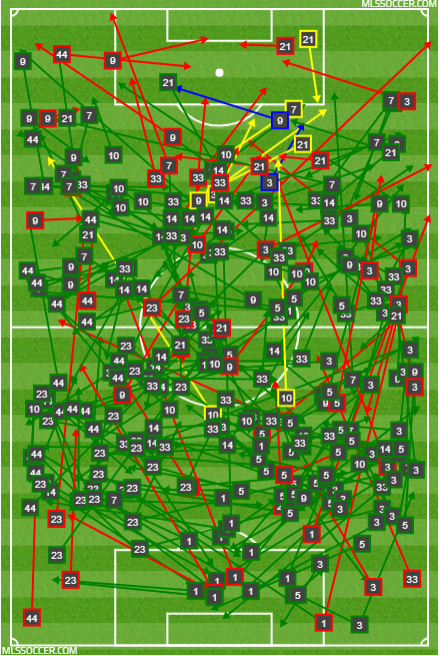 But even when they had a man advantage against Houston since the 35th minute, the Revs were content to give the Dynamo 47.5% of possession too. There’s nothing wrong with counter attacking soccer (in fact, I prefer it as I find fast breaks to be incredibly entertaining on the eyes), but if you’re going to commit most of your team to play behind the ball and stay compact, then you damn sure better not be conceding chances. And that’s exactly the opposite of what the Revs have done. The Union game really skews the xGA, but there’s absolutely no reason to be at home and to have xG in favor of the likes of Colorado. And the Houston match wasn't much easier to understand. Despite being up a man for the majority of the game, the Revs' defense gave up far too many chances to Alberth Elis and the Dynamo. In fact, they were outshot 9-8 during that span. The Revs have started well, and have Diego Fagundez playing at a high level again, but their defense will need to tighten up and limit opposition chances if they want to make the playoffs this year. The Revs return home this weekend to face a surprisingly solid Montreal team, while LAFC travels to Atlanta for a taste of last season's expansion success story. If either team takes a lead or goes up a man, it will be interesting to see how they react: will it be more of the same struggles, or will they adapt?